This picture taken on June 30, 1941 shows German Jagers from 136th Tyrol Mountain Regiment of the 2nd Mountain Division of the Mountain Corps Norway extrajudicially killing Soviet POWs. Barely a week into the war, Soviet POWs, who bear their heads high and facing death, are executed on sight. "The subject of Soviet losses in WWII is a very sensitive one in Russia. The military establishment appears bent on sticking to the numbers given in Krivosheev's 1993 book, "Security Classification Removed" which was updated in 2001 as "Losses in the Armed Forces". This book gives a total military personnel permanent loss figure of 8,668,400. Others researchers give higher figures, sometimes fantastically higher. The issue of losses is intimately connected with the issue of the Red Army's performance during WWII, particuarly the performance of Zhukov. As the deputy chief editor of this journal I am constantly aware of the polemics which carry on in these pages on the subject of permanent [bezvozratnyy] losses of the Soviet Armed Forces during the Great Patriotic War. Having served more than thirteen years in the Central Archives of the Defense Ministry of the Russian Federation [TsAMO], three of them as chief of the Department for Registering Permanent Losses among Sergeants and Privates, I know the true situation in this area very well. For some time I have been forced to observe in silence the bitter arguments between my comrades and their opponents. I justified this to myself because on-going research in the archives was not yet finished. But these arguments have reached a culmination, and the work at TsAMO to the count the losses still has several years yet to go, so I no longer have the right to remain silent. Therefore, following my conscience, as an officer and the grandson of a man who, on 17 November 1941, as a tank mechanic-driver in the 26th Tank Brigade, died defending Moscow, I think it my civil duty to publish this article. The older generation will well remember that for several decades after the war personnel losses in the Soviet Union were officially given as 20 million persons (this number includes military and civilian losses). With the declassification of many archives in the 90’s, this number grew to 27 million. Then, for the first time, the losses of the Armed Forces of the USSR were publicized. In an interview in March 1990 with the editor of the Journal of Military History [Voenno-istoricheskiy zhurnal, No. 3, 1990, page 14], the Chief of the General Staff of the Armed Forces of the USSR, General of the Army M. A. Moiseyev, stated that during the Great Patriotic War (including the campaign in the Far East against imperialist Japan in 1945) the number of military personnel killed, missing, captured but not returned, died from wounds, sickness, and accident, numbered 8,668,400, of them 8,509,300 in the Army and Fleet, 97,700 in the internal troops, and 61,400 in the border guards. These numbers mentioned by the Chief of the General Staff, were determined by a commission which worked in 1988-1989 with the reports of Fronts, Fleets, Separate Armies, rear services organizations, and checked against the count kept by the General Staff in the entire war. This same number was given in a large investigation of personnel losses in the Great Patriotic War “Security Classification Removed” [Grif Sekretnosti Snyat] which came out in 1993 under the general editorship of G. F. Krivosheyev, Candidate of Military Science, General-Colonel (retired). In the present article I would like to talk about another source which contains information about losses in the Armed Forces of the USSR during the war – about documents which are preserved in TsAMO. On July 9, 1941, within the Chief Directorate for Forming and Outfitting the Red Army (GUFKKA) was formed a Department for Registration of Personnel Losses and Bureau of Letters. The department’s assignment was to keep a register of personnel losses in the Armed Forces, to maintain an alphabetical card file of losses, and to conduct scientific research related to this. On February 5, 1943 the department became the Central Bureau for Registration of Personnel Losses in the Active Armies, still under the GUGKKA, and on April 19, 1943, it became the Directorate for Registration of Personnel Losses in the Active Armies. It consisted of eight departments: Registration-Statistical, Card File, Letters with Loss Information, Inquiries about Servicemen, Letters with Information for the Card File, Special Projects [prikaznyy], Inspection, and Miscellaneous. Because the responsibility for registering losses among officers was transferred to the personnel agencies of the People’s Commissariat for Defense in June 12, 1943, the Directorate was renamed as the Directorate for Registration of Personnel Losses Among Junior Commanders and Privates of the Red Army, and was put under the head of the Chief Directorate for Rear Services of the Red Army. As of March 26, 1946 the Directorate was subordinated to the Chief Staff of the Land Forces, and after the elimination of this Chief Staff, was turned into the Department for Registration of Killed and Missing Privates and Sergeants as part of the General Staff of the Armed Forces of the USSR. On December 30, 1965, the Department was put under the Archives of the Ministry of Defense of the USSR (now TsAMO). The Department preserves reports from active armies dating from the first days of the war concerning servicemen who were killed, missing, died from wounds and other reasons in large and small units as well as various military institutions. At the same time, information about servicemen who died of wounds or illnesses in hospitals or for other reasons came in from districts in the rear. It must be clarified that, due to the difficult situation at the front, a full accounting of losses was not always possible, especially in the first years of the war. In such cases it was done not by name, but by overall totals. In order to identify the persons in such reports, starting in 1942 a registration was begun on the basis of reports from relatives of servicemen. There were instances when military units could not conduct burials or include in loss reports permanent losses of dead privates and sergeants. Burial was carried out by the local population after liberation from the fascists, and the territorial military commissariats drew up lists of those interred based on personal documents of the deceased and soldiers’ medallions [a type of dog tag]. Immediately after the war and by 1949 the military commissariats conducted the so-called “canvass of yards” where they went to people’s yards and homes with lists of questions for relatives of frontline soldiers who did not return from the war, with the aim of identifying the missing. Such servicemen make up 60% of the card file. Lists and cards captured in 1944 which identify servicemen who died in captivity and other captured documents received in 1947-48 helped determine the fate of many. All of the documents listed above make up the collection of more than 32,000 archival files at the Department for Registering Permanent Losses among Sergeants and Privates at TsAMO. On the basis of these, alphabetical cards for each serviceman – killed, died, missing, suicides, etc. - have been created with biographical information. Now in an alphabetical card file, they are the basic informational tool both for answering inquiries and for scientific research. Additions to the card file as well as systemization and clarification of the information continue to this day. The last addition to the collection was made in 1993, when around 11,000 files with lists of servicemen who died from wounds in hospitals, medical battalions, and other treatment institutions were received from the archives of the Military Medical Museum in St. Petersburg. This resulted in a massive increase to the card file. Many servicemen who were counted as missing were re-categorized as died in hospitals and medical battalions after reviewing these files. For some servicemen there are several cards. On one he is listed as missing, on another as died, etc. These cards are stapled together and counted as one person. Counts were also made of deserters, servicemen sentenced to correctional labor institutions, servicemen sentenced to death, servicemen removed from the count of permanent losses (i.e. turned out to be alive), servicemen suspected of collaborating with the Germans, and servicemen who were captured but survived. As of November 1, 2000, last names starting with 20 letters of the alphabet were finished. These charts do not include counts of deserters, those convicted or executed, etc. They only include information from the eight categories listed above. Preliminary counts have been made for the remaining six letters of the alphabet (B, L, S, T, Ch, Ya). They could change by 30-40,000 persons plus or minus after the work on the card file is completed (see chart). From the 20 letters which have been counted, 116,513 person were removed from the total of permanent losses because they turned out to be alive according to reports from military commissariats. Of the remaining uncounted letters, it is reasonable to assume that there will be 30-40,000 more such people. The end result will be a number of around 150,000 persons who, according to reports from military units and military commissariats, were mistakenly counted as permanent losses, but who later turned out to be alive. They make up approximately 1.2% of the card file. 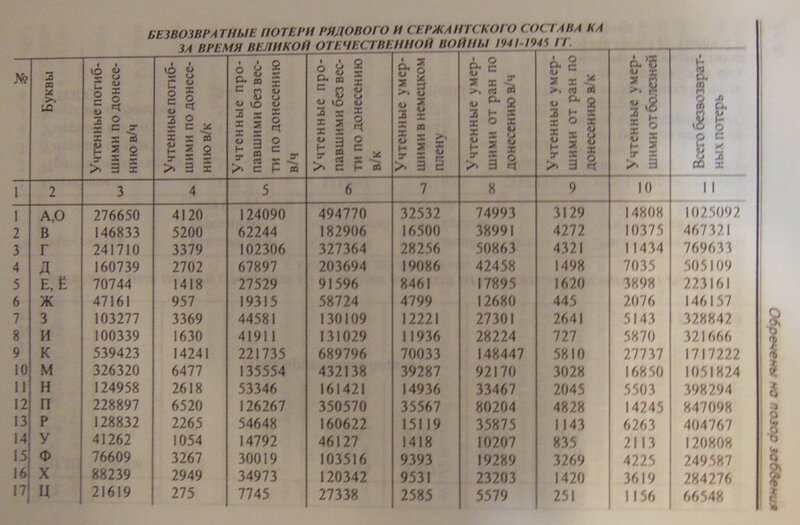 The movement and losses of officers of the Red Army was controlled by the Chief Personnel Directorate of the People’s Commissariat for Defense, which also created an alphabetical card file of permanent losses based on lists and reports. This card file is also preserved at TsAMO, and one cannot but agree that these two card files contain the most exact and complete information on personnel losses in the Great Patriotic War, because behind every report which caused a card to be written, at one time stood a live person, not an empty statistic. At the present time the losses among officers with last names beginning with the letter “A” to the letter “O” have been counted. A preliminary count has been made for the rest of the letters (see chart). A preliminary count of permanent losses of officers with last names beginning with the letters “P” through “Ya”, subtracting those sentenced to prison or execution, deserters, or who were alive, is around 350,000 persons. Therefore, officer losses in the Great Patriotic War (killed, missing, died of wounds, illness, or in captivity) is around 1,100,000 persons. - losses in border troops 61,400 (according to the book “Security Classification Removed”, page 129). We end up with a number for permanent losses of our Armed Forces in the Great Patriotic War of around 13,850,000 persons." We end up with a number for permanent losses of our Armed Forces in the Great Patriotic War of around 13,850,000 persons.